'East of Suez': Are UK forces returning? Is Britain quietly re-establishing a permanent, strategic military presence in the Middle East, reversing a 1960s decision to withdraw UK forces from "east of Suez"? It is a question posed and addressed in a detailed report published on Monday by Whitehall think tank the Royal United Services Institute (Rusi). "It may not yet be declared government policy," says Rusi director Prof Michael Clarke, in the foreword. "But the UK appears to be approaching a decision point where a significant strategic reorientation of its defence and security towards the Gulf is both plausible and logical." In practice this has already begun. Beneath the cloudless desert skies of the United Arab Emirates, a squadron of RAF Tornado jets is currently based at Al-Minhad, a discreet and well-guarded airbase south of Dubai. Last November, I watched UK Prime Minister David Cameron fly in here to inspect a squadron of RAF Typhoons on exercise, accompanied by his Emirati hosts. Since then, millions of pounds have been spent by the UAE on upgrading the base which will soon serve as a vital staging post for the withdrawal of British combat forces and their equipment from Afghanistan. In Bahrain, at another military base well out of the public eye and set apart from that country's simmering unrest, Royal Navy personnel man the naval HQ known as the UK Maritime Component Command (UKMCC), directing Britain's minesweepers and frigates around the Gulf, in co-ordination with the far larger US Navy 5th Fleet headquarters. 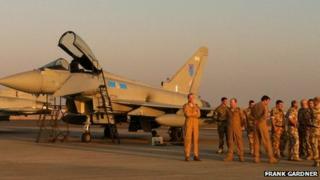 In Saudi Arabia, where western military forces are no longer based, pilots on secondment from the RAF are providing continuity training on Typhoon jets for the Saudi Royal Air Force, part of a massive UK-Saudi defence deal. In Oman, which in 2001 hosted the largest British overseas military exercise in recent history, the defence relationship is so close that a British two-star Major General is stationed permanently in the capital Muscat, to oversee the relationship. In Qatar, the first course of a British-run staff college is due to begin this September and Kuwait has just chosen the UK to help run its own equivalent of the Royal Military Academy at Sandhurst. Much of this is the work of Lt Gen Simon Mayall, Britain's defence senior adviser to the Middle East, appointed in 2011. For Britain, the strategic rationale behind all this goes way beyond defence sales, itself a controversial issue given the highly questionable human rights records of some of the countries concerned. It comes as three Britons have been found guilty of drug offences in the UAE. A human rights group says they were tortured. In December, the UK's Chief of Defence Staff Gen Sir David Richards said: "After Afghanistan, the Gulf will become our main military effort." The idea is to pre-position forces and equipment in the Gulf before they are needed, while simultaneously showing support for countries considered allies. For Arab Gulf governments, unnerved both by the Arab Spring upheavals of 2011 and by Iran's growing regional ambitions, Britain's renewed military commitment, however small, offers some reassurance at a time when the Pentagon is focusing increasingly on the Pacific. For David Cameron and his ministers - who Arab leaders believe have paid a lot more attention to the Gulf than the previous UK government - increased defence ties are a logical extension of a historic partnership the prime minister is keen to build on. The way some see it, Britain is deep in debt while certain Gulf states have astronomical amounts of excess funds. To them it makes sense to tap into this relationship by providing bases, training and even, as in the case of the UAE, joint development projects in defence and aerospace. "We are already committed to the Gulf," said a senior British officer who asked not to be named. "But we are just not doing it very well. "There are 160,000 British citizens living there so if there is a crisis we will be involved, so we need to be better positioned to mitigate the threat." But how much of a departure is this Gulf defence policy really? Not so much, says the Rusi study published this week, arguing it is really more of a stepping up in gear of something that was already there. "With regard to Arabia and the Gulf, the formal withdrawal from major bases east of Suez did not signal the end of British military involvement there - far from it," the report says. Their paper argues that "it is of considerable economic benefit to the UK to be the leading European - and indeed, Western - player in the Gulf". But it also warns of unintended consequences, of the risks of getting drawn into conflicts not of our making in a volatile part of the world, including becoming embroiled in the sectarian Sunni-Shia friction that is troubling Bahrain and Saudi Arabia's Eastern Province. There is also the risk that, somewhere down the line, there will come a sharp difference in policy and, in a worst-case scenario, that the UK may even be prevented by host governments from using the very bases and agreements in which it is currently investing so much.